The TCP VAV unit is typically used in systems that require perimeter heating in winter of supplementary cooling in certain occupied zones. 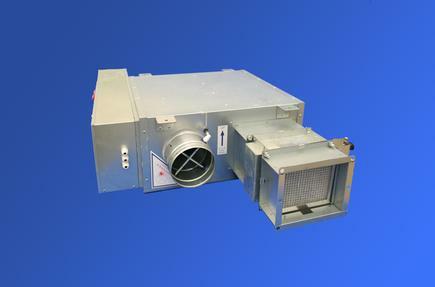 It consists of two major components, a primary air damper and a secondary air induction indoor fan. A pressure independent control of the primary VAV damper is accomplished by using a differential pressure grid which provides an accurate control of air flow. Mixing between the primary air and the induced warm recirculated air from the ceiling void is achieved by means of a forward-curved centrifugal fan with a direct drive motor. For winter operations, the induction fan provides an economical way of utilizing the recycled heat generated by inner zone. The fan transfers the recycled heat from inner zone to the perimeter zone utilising the returned air from ceiling void or rooms. Cycling of the fan results in energy savings as activation is only required when required in a specific zone. Placement of the fan is critical to ensure the desired occupant comfort levels. Hot water coil or electric heater for secondary heating is available. All controllers or electrical components are factory fitted and VAV controller is factory calibrated.